You can check his travel blog with many useful tips here. “After the Friday beach party at the Drivethru Surfcamp, I was up and ready for an early surf, in the kitchen looking for a cup of coffee. There are no surf lessons on the weekend and most of the guests sleep late. However, one girl was already awake and she told me about the Surf Kids Club in Medawatta. Held every Saturday, the club offers surf lessons free of charge for local kids. My interest was aroused and I wanted to learn more about it. This could be a good item for the blog. Unfortunately, it was my last Saturday in Madiha before I went back to Dalawella, otherwise with pleasure I would have been there. Somebody suggested I come another Saturday. Two weeks later at the station in Galle. My surfboard leans on my shin, sweat running down my back. My teeth grind nervously on my second coconut roti. Today of all days, the train is delayed for more than 30 minutes. It doesn’t matter, in any case I want to see the kids surfing. The kids are already warming-up when I arrive and I go to the assistants. One of the locals was explaining to the kids in a harsh tone how to paddle and stand up. We do the usual dry runs. Lying on the board, paddle simulation, stand-up and remain in surf position. I am standing somewhat helplessly, but then I catch a boy and show him what I know. Doing a hollow back a little bit, paddling, standing up with drive and jumping into the correct position. Now it’s your turn! The boy with the yellow lycra and the purple trunks tries to imitate me. He is almost doing the splits after standing up and I show him the correct way to stand. Once again – splits! Patiently, I push his feet together, buckle his back knee with my right hand and push his upper part of the body over the front knee. Now it looks better. Once againl! And again splits. Maybe it was the same thing with me at the beginning. I show it to him once again. He is watching me attentively. Finally we go into the water. The kids have fun. I can only guess the bright faces when I push one of them into the waves on a board and he slides away. Fantasticl! Unfortunately, I did not have that childlike ease, intrepidness and curiosity with my first steps on the surfboard as I was already 30 years old. Anyway it feels good to teach the boys and girls how to surf. I want to write about it. 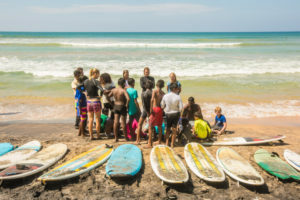 Katia, the foundress of the Surf Kids Club Medawatta, also thinks it is a good idea, so we set up an interview and this is what she has to say! 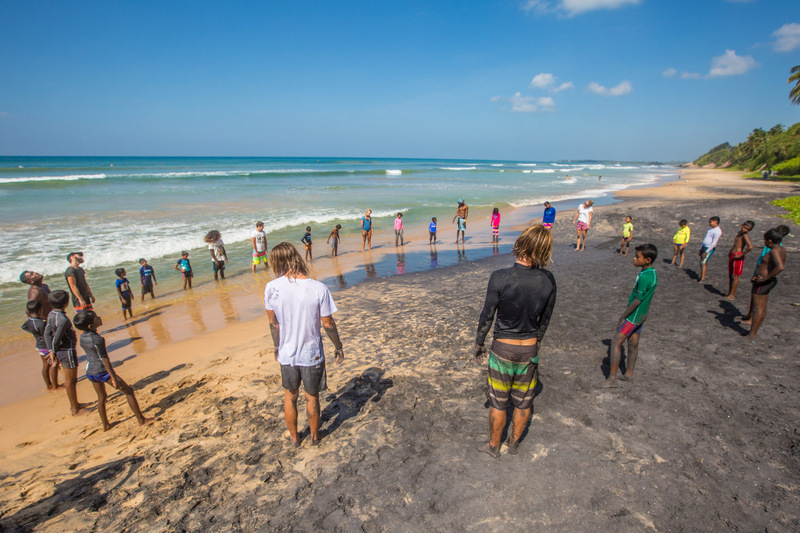 What was your reason for setting up the surf school for local kids? For me it was a natural thing. I live here and I want to give something back to this beautiful island. It was the least I could do. You cannot only take, you also have to give! Who was the founder of the Kids Club? 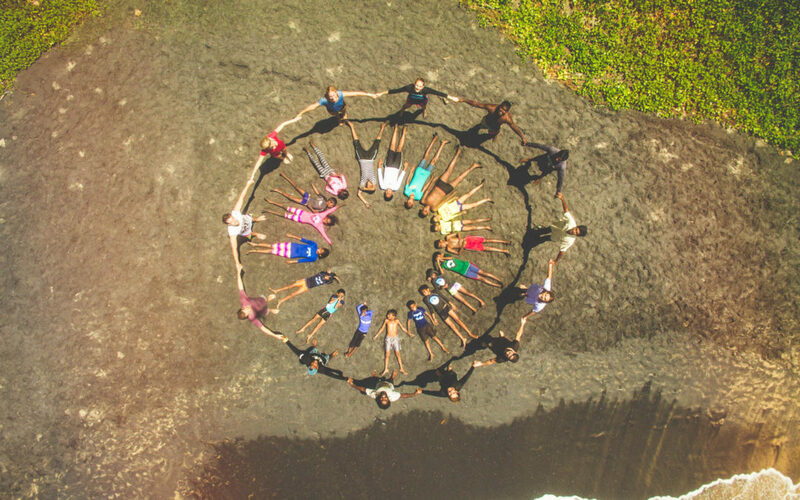 I am the foundress of the Surf Kids Club Medawatta. I wanted to do it already last year, but there was no place or time for it. Everything needs its time and this year was perfect. Then I met Thushan, a local surf teacher and I told him about my idea. He was stoked and wanted to be part of it. When did you start and how was it? We started in January 2016. Leo, Thushan and me. It was spontaneous. I decided on a Tuesday – “We talked enough, now we are doing it!“ Thushan proposed to make it on Saturday as it is his one day off. Then we prepared a poster with his wife help in Sinhalese. I was so happy that day I put it on a wall close to the beach. There were some fathers around and I told them about my idea. They were so excited and promised to bring along their kids. They really did! What did you do to get in touch with the locals? Leo already lived in this village last year. So it was easy for me as I already knew the locals and they trusted me. We just made that one poster and told the neighbors about it. In the first lesson, there were six kids – then it was like an avalanche. We just repeated the idea each week and by the last lesson there were 25 kids! Normally you should have one adult for two kids. It is a big responsibility and the ocean remains the ocean. We had a lot of friends visiting us during the season and they were all happy to support us. Many thanks to you guys! Then the Drivethru Surfcamp and other local surfers started to participate regularly. I think the locals were shy to participate at the beginning. 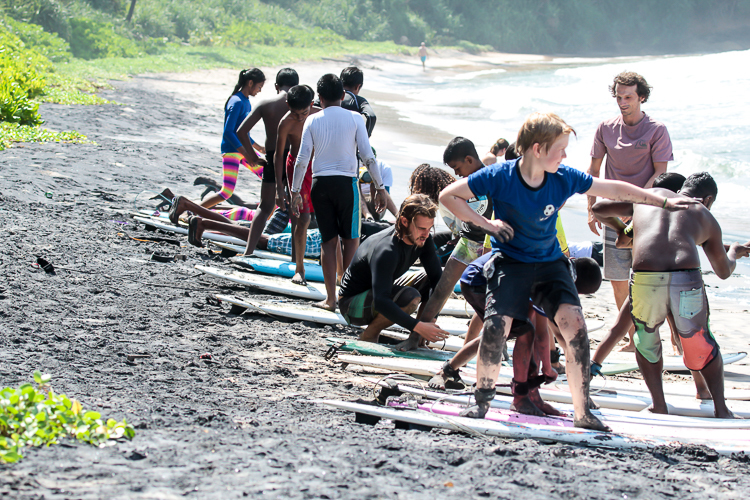 How do you finance the Surf Kids Club Medawatta? We originally got some donations from our friends – Steffi S., Eva and Chris. They all helped us with the Surf Kids Club during their holidays on the island. The rest we raised from our savings. The Drivethru also donated a softtop board. The locals from S.K. 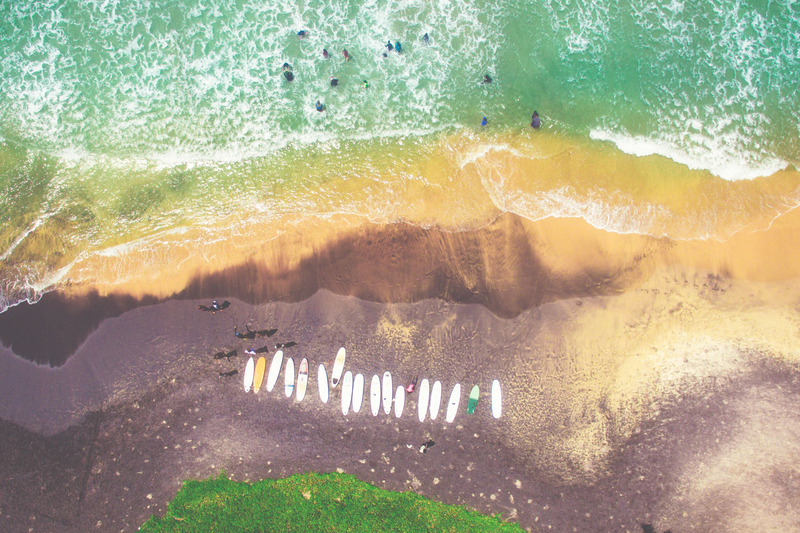 Town are also very supportive – if they have a surfboard, they bring it to the surf lessons. Some of them also bring packets of Milo (a very popular chocolate drink in Sri Lanka) for after the surf lesson. During the summertime in Europe, I would like to collect more donations in material or gift form. We previously gave the kids lycras and leggings for the girls, which really boosted their self-confidence. So if you want to support us, please contact us! 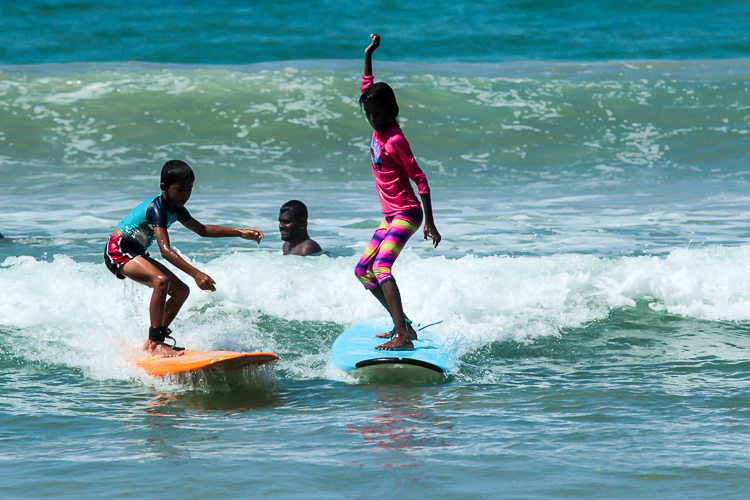 What are your plans for the Surf Kids Club Medawatta? This year, we got a good impression of how it works. Now it is time to work out how we can do it more professionally next year. We need to have two groups: beginner and advanced learners. We also need to limit the number of participants – I don’t think there should be more than 25 kids. How do you feel seeing the laughing kids? I love kids and I love to work with them. Many of the kids here live close to the sea but don’t swim or surf – only in their dreams. When you were with us, you saw how happy the kids were spending time with us. When I see this laughter and happiness, I know we are doing the right thing here. Thank you sharing your experience with us. I have the greatest respect for what you’ve managed to get up and running.